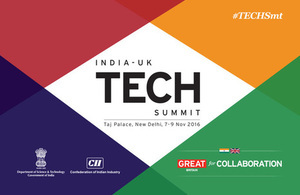 Professor Vijayakumar, ECR Director, will be one of the high profile speakers headlining the biggest showcase of UK-India Technology in sectors ranging from Agriculture, Life Science, Healthcare, Smart Cities, Advanced Manufacturing and of course, Robotics being held in New Delhi on Nov 7-9, 2016. ECR affiliated student, Aga, and enterprise fellow, Sandy, will showcase live demonstrations of their research at the high profile exhibition venue. TECH Summit is India’s largest knowledge and technology conference and exhibition and is being supported by the UK Department of International Trade (DIT), India's Department of Science and Technology(DST) and Confederation of Indian Industries (CII).